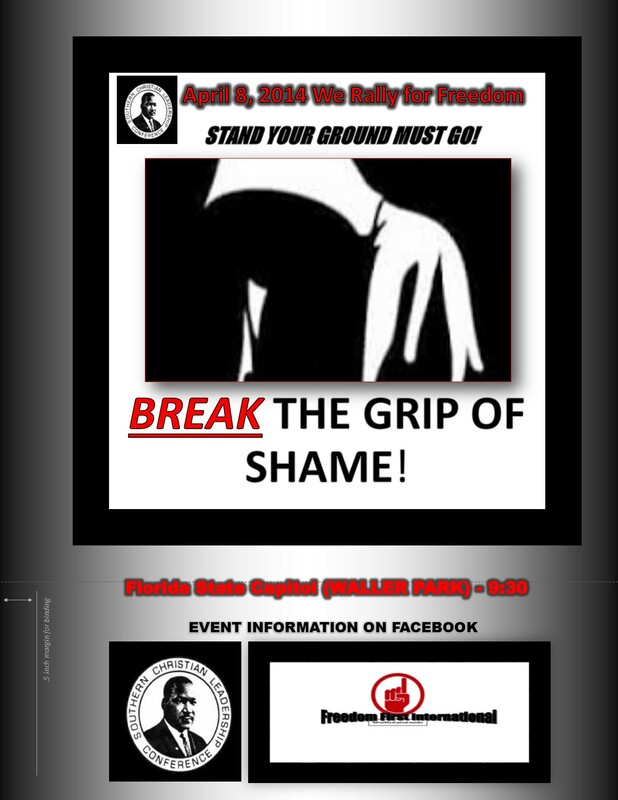 Florida leaders Prepare to fight “Break TheGrip of Shame”-Stand Your Ground Must Go! On Tuesday April 8, 2014 at 9:30 am hundreds are expected at the State Capitol to rally in question of a law that senselessly expands the concept of self-defense and sows dangerous conflict in our neighborhoods. Last year, the Tampa Bay Times analyzed 134 fatal Florida cases in which the Stand Your Ground defense was raised or played a role. Out of the 134, 19 percent of the cases involved the deaths of children or teens. Another 14 involved victims were 20 or 21, and another 8 teens were injured in nonfatal cases. It seems as though these Stand Your Ground laws aren’t doing anything to deter violence, but encouraging it and adding to the murder rate. Stand Your Ground is one of the most dangerous pieces of legislation ever known in America since organized “lynching.” If you maintain “stand your ground” as the reason you shot at and killed someone, whatever happens to you can depend less on the merits of the case than on who you are, and in whatever state your case is decided.” said Reverend Gregg Greer a member of the Southern Christian Leadership Conference-Rally Lead Organizer-We want everyone to STAND WITH US! This entry was posted in Civil Rights, Gregg Greer, greggrreer, Human Rights, One World, oneworld, oneworld01, Police Kill, SCLC, Uncategorized, Urban Christian Leadership, who was the victim of one of the most horrible incidents of racial prejudice and a broken justice system in United States History. Florida leaders to Prepare to “Break TheGrip of Shame”-Stand Your Ground Must Go! I WOULDN’T MINE PROTESTING BUT I AM REALLY AFRAID THAT SOMEONE MIGHT SHOOT ME. MY SIX YEAR OLD SON DOESN’T WANT TO GO TO FLORIDA BECAUSE HE IS AFRAID THAT SOMEONE MIGHT SHOOT HIM. You will be protected-Gabby! It’s time for change!